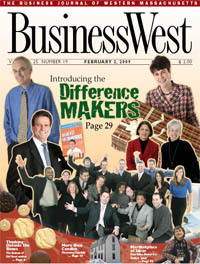 Their contributions vary, from helping to improve the quality and diversity of the regions workforce to providing books for local school libraries; from donating time, energy, and know-how to area nonprofit agencies to spearheading efforts to engage, involve, and educate the Valleys young professionals. The common denominator is that these individuals are all making a difference in Western Mass. Theyre not the only ones, certainly, but their stories reflect the work of countless others to make this a better region in which to live, work, and run a business.